K M Zafari loves all forms of writing but is most passionate about screenwriting and, of course, flash fiction. She’s a vegan that loves film, bats, aliens, and world cultures. She has spent half of her life trying to escape from the dry, desert air that she grew up in. So far, she hasn’t been successful. Sometimes dark, sometimes silly. 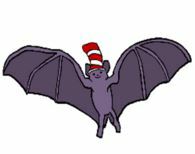 If Poe and Seuss had a love child, it would probably be… unattractive – but might think just like me.